Charaideo was the first capital of the Ahom kingdom in Assam and the Maidam is the sacred burial ground and a place for ancestral Gods of the Ahom Kings. 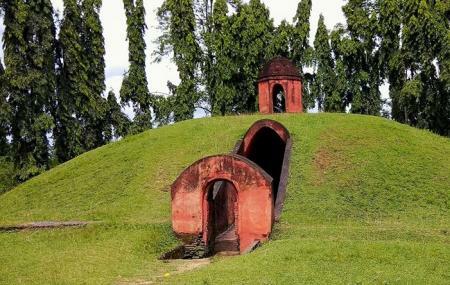 Also known as the Pyramids of Sivasagar in Assam, the site is located on the hills of Charaideo amid the lush green fields. Among 150+ maidams, only 30 maidams are protected by the Archaeological Survey of India and the rest are in ruins. The excellent architectural skills of the sculptors and masons on the medieval days are wonderful to look at. The vaults are decorated with floral carvings and with domed chambers. Earthen mounds are heaped upon them making them look like hillocks. On top of each hillock, small pavilions made of brick and stones are set up for visitors to take stroll freely. The octagonal dwarf wall encloses the whole maidam. Create a customized plan for your visit using the Bokopukhuri Habi trip planner. You can use ready templates or start from scratch for the same. Draft the best Bokopukhuri Habi vacation packages using ideal templates offered by TripHobo. Also explore how to reach Bokopukhuri Habi on the go! Love this? Explore the entire list of places to visit in Bokopukhuri Habi before you plan your trip. Fancy a good night's sleep after a tiring day? Check out where to stay in Bokopukhuri Habi and book an accommodation of your choice. Nice place. Quite silent and pretty nice views. You can get a pretty good experience of liking hiking by climbing the small mountains like landmass. There are historic buildings there as well. Nice place. May be regarded as pyramid of India. Less known to people from other parts of the world. Having amenities for food and toilets. More information should be displayed. I stayed at the village for 15 days.The lights,air and everything is natural here Nice place.nice people. Nice place to relax and walk. Abduntant natural beauty.